Princess Helena was born at Buckingham Palace after a difficult labour on 25 May 1846 she was the third daughter and fifth child of Queen Victoria and Albert of Saxe-Coburg-Gotha, the Prince Consort. 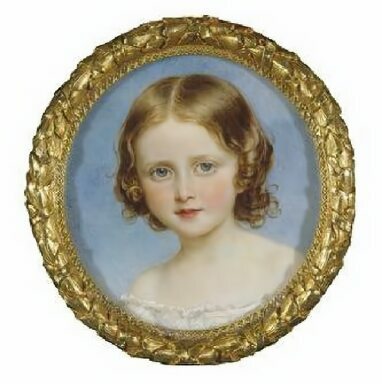 The new arrival was baptised Helena Augusta Victoria on 25 July 1846 at the private chapel at Buckingham Palace, but was always known to the family as Lenchen. Helena had an avid interest in science and technology, which she shared with her Father, Prince Albert, she played the piano very well at a young age, and enjoyed drawing and horse riding. When Helena was fifteen, her father died of typhoid on 14 December 1861 and her mother entered a period of intense and reclusive mourning. By the early 1860's, Princess Helena formed an emotional attachment with her Father's former librarian, the German Carl Ruland, who had been appointed to the Royal Household on the recommendation of Baron Stockmar in 1859. Ruland was employed to teach the Prince of Wales German and was well liked by the Queen. However when Victoria discovered her daughter Helena's feelings for Ruland in 1863, he was immediately dismissed. The Queen chose Prince Christian of Schleswig-Holstein, son of Christian August, Duke of Schleswig-Holstein and Countess Luise Sophie von Danneskjold-Samsöe, who was fifteen years her senior, as a husband for her daughter, and their engagement was announced on 5 December 1865. Christian and Helena were third cousins, through their mutual descent from Frederick Lewis, Prince of Wales, eldest son of George II and Caroline of Brunswick. 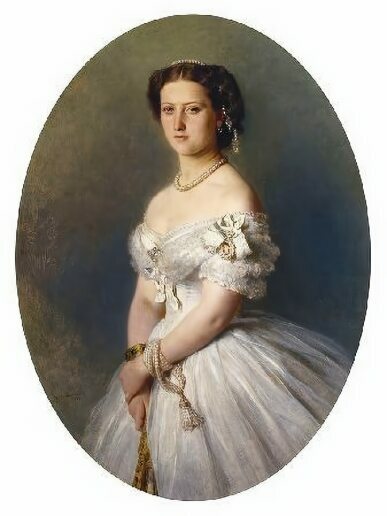 The marriage proved a controversial one in the family, due to Prince Christian's family's claim on Schleswig and Holstein, which was a matter of contention between Denmark, the homeland of Alexandra, Princess of Wales and Germany where Helena's eldest sister Victoria was Crown Princess. The couple were married in the Private Chapel at Windsor Castle on 5 July 1866. The Prince of Wales, who had threatened not to attend because of his wife's Danish connections, in the end accompanied Queen Victoria as she escorted Helena down the aisle. An observer commented that Helena looked as if she was marrying an aged uncle. As Helena had promised to remain close to the queen, and both she and her younger sister Princess Beatrice performed duties for her. After their marriage, Christian and Helena lived at Cumberland Lodge in Windsor Great Park. The first child of the marriage, Christian Victor Albert Ernst Anton was born on 14 April 1867, he was followed by a brother Prince Albert John Charles Frederick Arthur George of Schleswig-Holstein who was born on 26 February 1869. 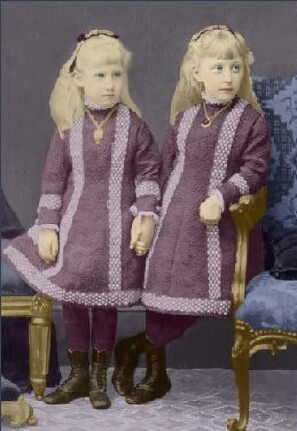 Two daughters followed, Victoria Louise Sophia Augusta Amelia Helena of Schleswig-Holstein on 3 May 1870 and Franziska Josepha Louise Augusta Marie Christina Helena on 12 August 1872. The couple's last child a son Harald died eight days after his birth in 1876. Prince Christian Victor became an officer in the British army, in October 1900, while in Pretoria, he contracted malaria, and died of enteric fever, on 29 October, aged 33. His brother Prince Albert succeeded his childless cousin Duke Ernst Gunther of Schleswig-Holstein-Sonderburg-Augustenburg as Duke of Schleswig-Holstein in 1921 butnever married. Helena's daughter, Helena Victoria, known to the family as Thora and sometimes unkindly as "Snipe", due to her sharp features, also never married, and followed her mother's example in working for various charities. Princess Marie Louise married Prince Aribert of Anhalt (18 June 1866 - 24 December 1933) at St. George's Chapel in Windsor Castle. Prince Aribert was the third son of Frederick I, Duke of Anhalt, and his wife, Princess Antoinette of Saxe-Altenburg. The marriage, however, was unhappy and childless and ended in divorce. It was rumoured that Aribert was homosexual and had been discovered in bed with a male servant, either by Marie Louise or his father. Like her sister Alice, Grand Duchess of Hesse, Helena held an avid interest in nursing, and became President of the British Nurses' Association upon its foundation in 1887. She was also active in the promotion of needlework, and became the first president of the newly established School of Art Needlework in 1872. Prince Christian lost lost his left eye at a shooting accident at Osborne, the consequence of a shot believed to have been fired by his brother-in-law, Arthur, Duke of Connaught being reflected downwards from a tree and passing through his eyelid and eye. The injured eye was later removed by Mr. Lawson, the Queen's oculist. Prince Christian died in October 1917, aged eighty-seven, shortly after the couple celebrated their fiftieth wedding anniversary. Princess Helena survived him by five years dying at Schomberg House on Pall Mall, on 9 June 1923 and was originally interred in the Royal Vault at St George's on 15 June 1923, her body was later reburied at the Royal Burial Ground, Frogmore. Helena and Christian's only grandchild was Valerie Marie, the illegitimate daughter of their second son, Prince Albert of Scleswig-Holstein. Born 3 April 1900 in Liptovský Mikulás, Austria-Hungary, her mother was never known. On 15 April 1931, shortly before his death, Albert wrote to his daughter, admitting his paternity. After this, on 12 May she changed her surname from Schwalb, the name of her foster family, to "zu Schleswig-Holstein". Valerie Marie married the lawyer Ernst Johann Wagner, but their childless marriage was formally annulled in Salzburg on 4 October 1940. When Valerie Marie intended to marry again, it became important to establish her parentage officially, as the Nuremberg Laws prohibited marriages between Jews and Aryans. This was done with the aid of her aunts, Helena Victoria and Marie Louise who signed a statement attesting to her paternal lineage on 26 July 1938, officially acknowledging her. She remarried on 15 June 1939, to Prince Engelbert-Charles, 10th Duke of Arenberg, this marriage was also childless. Valerie Marie died in Mont-Baron, Nice, France, on 14 April 1953 in an apparent suicide.